The Strong Lady is coming to town! Grow stronger and shine brighter as we play with ways to develop both physical and mental strength through training with nothing more than your body: Building a strength that is both powerful and graceful. 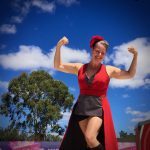 Journeying through life as a Strong Lady (combined with training as a circus artist, vinyasa yoga teacher, a theatre actor, a school teacher and speaker for events) has lead Charmaine to craft a series of workshops in developing physical and mental strength. Drawing on over 15 years’ experience of performing internationally as a Strong Lady & circus acro base, all of her work characterised by a playful mix of strength, grace and comedy. The Strong Lady explores mental feats-of-strength we can all perform alongside our physical strength training and brings the power of habit to centre-stage. 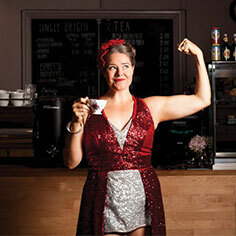 Charmaine has built a career out of lifting people into the air as if they were feathers, delighting in the things that make her different to other people and building a feeling of optimism and connection in her audiences. She has developed her physical and mental strength to allow her to uplift audiences around the globe… Now she is sharing what she learned along the way, by speaking at events and facilitating workshops. Workshops can be delivered as a stand alone, or linked to performance dates/speaking events. Bespoke workshop creation is possible, or adaptation of the workshops detailed below to suit your participants. Workshops can be quite static and contemplation based or more physical workshops based around circus skills, bodyweight training and yoga practice. All workshops include some link in the development of physical strength with enhancing mental strength. - This workshop is adaptable for a wide range of participants, physical abilities, events and locations. It can be delivered at festivals, yoga studios, schools, retreats, corporate events and more. - Requirements: clean floor space, yoga mats (or towels), comfortable clothes, socks. This workshop offers participants tools for creating a habit of daily strength training – and invites them to couple the training of physical strength with cultivating mental strength too. Explore exciting research about the brain, body and nervous system alongside the wisdom of yoga and positive psychology to reveal the power of physical and mental habits. Grow Strong encourages us to feel strong enough already. No matter how strong we get, there will always be further to go, yet many people get disillusioned or frustrated that they are not there yet – we never get there. When we abandon ideas of the body we ‘should’ have, then we can grow stronger in a way that is delightful and allows us to enjoy the journey. This workshop is about replacing ‘exercise’ with focused training. By replacing sporadic herculean efforts (or vague bursts of sweating it out because you know that you should) with a consistent habit of mindful daily training, you can Grow Strong in a powerful way. 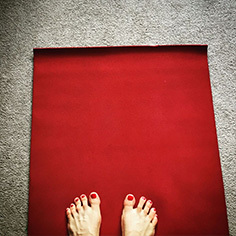 The time that we spend on the mat focused on training our physical strength, with it’s spotlight on alignment and activation of muscles, can be coupled with an awareness of what is going on in our internal world too. Training our bodies can become a powerful time for cultivating our minds through changing our habits of thought, breath and story. - This workshop series is designed for yoga studios, teacher training courses and retreats It is adaptable for beginner or experienced participants. - The series can be booked as a whole or each class can be a stand-alone experience. This is an extension of the Grow Strong workshop detailed above, designed for yoga studios and retreats. It is a series of 4 workshops that each go into more depth for the key elements of the original workshop. This workshop delves into information about cultivating habits and the power of a daily training practice. We explore how to craft flows and series of exercises for training, as well as to find motivation or space for it. The physical content focuses on habits of alignment and activation. The power of Habit plays with a range of exercises for core stability, activation for glutes and the shoulder complex, and we go back to basics, breaking down sun-salutations as a strength building tool. It is by focusing on changes to our daily habits that we can create epic changes in our physicality, our internal world and our experience of the world around us. This workshop looks at the place where yoga philosophy, neuroscience research into the nervous system and phycology about the flow state intersect – cultivating a sense of play in our training practice. The physical content focuses on breaking down yoga arm balances and handstands – we create small flows to build up to each that we can incorporate into our daily practice to build the strength and agility to find the final poses. The beauty of practicing arm balances and handstand is in the journey of learning to meet frustration with lightness. To be non-violent and playful in our approach to things that are challenging and a bit scary. This workshop delves into ways we can cultivate internal balance as we play with yoga poses and core stability exercises which challenge our physical balance. We work to find balance between effort and contentment: effort without attachment or aversion, growing rather than striving. How can we can incorporate mental strength training with our physical practice, cultivating balance in vagal tone and emotional stability? Playing mostly with standing balance poses (as well touching on arm balances and core work) we create flows that cultivate physical balance. We also experience breath work (pranayama) exercises that can help create internal balance. We create flows that build to each balance pose to incorporate ate into daily training practice to enhance our balance. This is a very restorative workshop. We discuss the ways we can use breath work, habits of thought/attention, or adapting muscle tension and posture to influence the nervous system, so that we encourage dominance in ease and healing mode (PSNS) rather than in the reactive and inflammatory fight or flight mode (SNS). The workshop includes facia release with ball rolling or held poses, pranayama breath work techniques and meditation. There is a small flow element to the workshop to explore how we can also bring ease to our practice even where there is effort, through non-violence and effort without attachment or aversion. This workshop can be teamed with one or more of the others in the series as a closing practice, or can stand alone. - This workshop includes a projected presentation and small elements of performing feats-of-strength to illustrate information. It can be delivered at corporate events, schools, retreats, yoga studios and more. - Requirements: Tables and chairs, notebooks and pens. Worksheets will be provided. This is a clarity building and ‘goal setting’ workshop that invites you to focus first on identifying the way you want to feel and move through the world. By making this state our primary goal then we can guide our decision making in setting more specific goals to attain and tasks to prioritise. This is a workshop peppered with mental strength training techniques to take the heavy lifting out of creating change and cultivating clarity. Pursuing your dreams shouldn’t feel like another heavy to do list… and our dreams shouldn’t look like a shopping list. Give yourself a fresh start to move forward in an authentic way. By focusing first on what you want to feel and be, (rather than just an exhausting list of more things to do, get and prove) you will uncover a simple and elegant road map to guide you there via visions, goals, projects, right down to the power of small daily choices, practices and habits. It’s always a good time to Start Strong! "Thanks for an amazing evening. Learnt so much and already feeling stronger." "Charmaine's Grow Strong workshop was a real success… It brought together people of widely differing age and ability in a very supportive and enjoyable experience which fused the holistic qualities of yoga with the ambition and zest of the circus. Everyone found strength and confidence and left the room with a big smile and increased awareness of just how incredible the human body can be."